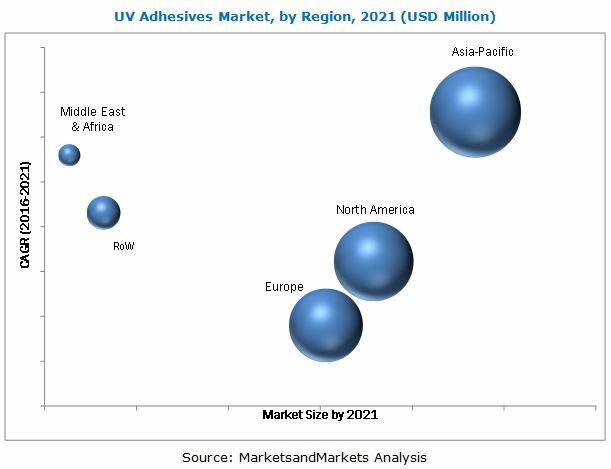 [270 Pages Report] The UV adhesives market is expected to reach USD 1,222.5 Million by 2021, at a CAGR of 9.15% between 2016 and 2021. In this study, 2015 has been considered as the base year for estimating the market size. This report aims to estimate the market size and future growth potential of the UV adhesives market across different segments such as resin type, application, and region. Factors influencing the market growth, such as drivers, restraints, opportunities, and industry-specific challenges have been studied in the report. Furthermore, the report analyzes the opportunities in the market for stakeholders and presents the competitive landscape for market leaders. Top-down and bottom-up approaches have been used to estimate and validate the size of the global market and estimate the sizes of various other dependent submarkets in the UV adhesives market. The research study involved extensive use of secondary sources; directories; and databases, such as Hoovers, Bloomberg, Chemical Weekly, Factiva, Composites World, Related Associations/Institutes, and other government associations. Company websites were also used to identify and collect information useful for the technical, market-oriented, and commercial study of the global UV adhesives market. After arriving at the total market size, the overall market has been split into several segments and subsegments. 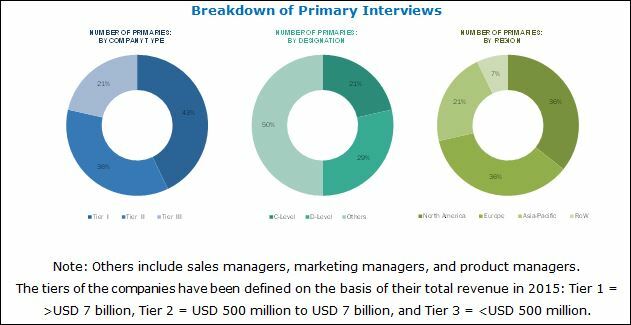 The figure given below provides a breakdown of primaries conducted during the research study, on the basis of company type, designation, and region. The UV adhesives market has a diversified and established ecosystem of its upstream companies, including raw material suppliers and downstream stakeholders, such as manufacturers, vendors, end users, and government organizations. In the UV adhesives value chain, the design and prototype phase is carried out according to the end user specifications and requirements. These specifications and requirements are different across diverse application industries. Key companies operational in the UV adhesives market include Henkel AG & Co. KGaA (Germany), H.B. Fuller (U.S.), Ashland Inc. (U.S.), Dymax Corporation (U.S.), The 3M Company (U.S.), Permabond Engineering Adhesives (U.K.), Master Bond Inc. (U.S.), Panacol-Elosol GmbH (Germany), and Epoxy Technology, Inc. (U.S.). This research report categorizes the global UV adhesives market on the basis of resin type, application, and region. The UV adhesives market is projected to reach USD 1,222.5 Million by 2021, at a CAGR of 9.15% between 2016 and 2021. Increasing demand for solvent-free adhesives in medical, glass bonding, transportation, and electronics applications is expected to lead to the growth of the UV adhesives market. Medical was the largest application segment of the UV adhesives market in 2015. Increasing aging population and innovation in medical procedures are expected to lead to increased demand for medical devices, such as IV delivery systems, catheters, syringes, hearing aids, silicone rubber components, among others. Since UV adhesives are increasingly being used in the manufacturing of these devices, the rise in the demand of the devices is expected to consequently lead to the growth of UV adhesives market. Silicone is expected to be the fastest-growing segment of the UV adhesives market, segmented by resin type. This growth can be attributed to the fact that silicone-based UV adhesives are widely used across several end-use industries for different applications, due to their low surface tension, high chemical & temperature resistance, and hydrophobic nature. Asia-Pacific is expected to be the largest market for UV adhesives. The demand for solvent free and eco-friendly adhesives has increased in medical and electronics applications, which is expected to drive the demand for UV adhesives in the region. The high cost of UV adhesives, as compared to other conventional adhesives, such as thermal cure and moisture cure adhesives that are used in the medical, electronics, and glass bonding applications, may restrain the growth of the UV adhesives market in near future. Companies such as Henkel AG & Co. KGaA (Germany), H.B. Fuller (U.S.), Ashland Inc. (U.S.), Dymax Corporation (U.S.), The 3M Company (U.S.), and Permabond Engineering Adhesives (U.K.) are the key players in the UV adhesives market. Diverse product portfolio, various R&D activities, and adoption of diverse development strategies are some of the factors that strengthen the position of these companies in the UV adhesives market. The companies have been adopting various organic and inorganic growth strategies to achieve growth in the market. 18.7 Threebond Holdings Co., Ltd. Figure 77 Electronic Materials Inc.: Company Snapshot"